This image is from the prospectus for The House of Life. 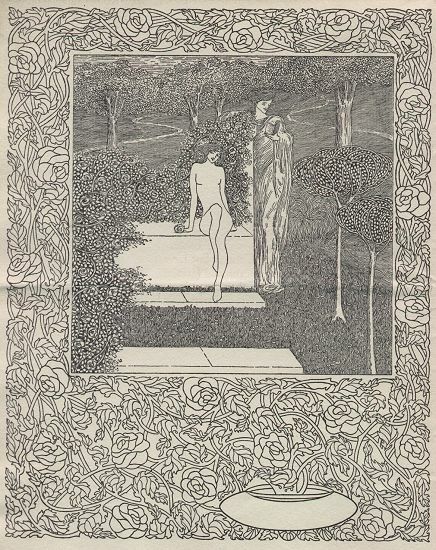 The specimen pages which are shown in the present circular are taken from the edition of The House Of Life by Dante Gabriel Rossetti, which is now being printed by Mr. Clarke Conwell at the ELSTON Press. The title pages, borders, initials, and decorative fore- and end-pieces have been cut directly from the drawings as made by H. M. O'Kane. The type used, which is a new font especially cast for this book, is the Roman face recut in this country from the beautiful letter cut by Nicholas Jenson and first used by him in his Eusebii Praeparatio at Venice in 1470. The printing, directly from the type, is being done wholly upon the ELSTON hand-presses. The paper has been made by hand in America, after Mr. Conwell's own specifications and bears the ELSTON watermark, The House of Life being the first book to be printed on this paper. It is of a special size for this book, to allow of being worked in fours on the full sheet, the printing being on one side of the paper only. The edition will be limited to four hundred and thirty-five copies, each numbered in manuscript and stoutly bound, with linen back, and sides of specially prepared boards. The price of these copies will be ten dollars in America and two guineas in Great Britiann carriage paid in every instance. Sixty numbered tall copies will be printed on Imperial Japanese paper, and bound in plain boards with back strip of linen, and paper label. The price of these copies will be twenty-five dollars or five guineas each. No copies will be bound in full Vellum. Subscriptions may be sent to Mr. Clarke Conwell at One hundred and thirty-nine Fifth Avenue, New York City, and each subscription will be entered as it is received. Mr. Conwell requests that cheque be enclosed with subscription. Wednesday, April the tenth 1901. The background of this page is taken from the Elston printer's mark on the front of the prospectus.